I love when we get a couple of years out of a fun trend because then the more affordable stores are a lot more likely to carry cute pieces (I'm looking at you) at a price point I can appreciate. While I think it's smart to buy and wear classic pieces that will stand the test of time - it's still fun to add a little flare here and there, right? RIGHT. Simon was out of town this weekend and as always! I had ambitious goals in mind (think big closet clean-outs, laundry room deep clean, etc etc) but as always! I quickly parked myself right on into survival mode and considered the fact that we ordered pizza one time and not multiple times - a great success. I rented and watched some movies that Simon could live without seeing and hunted and gathered the embroidered pieces pictured above. So, basically the same as a sparkling clean laundry room, in the end. Anyway - here's what we're working with. I might have to do a round two because I'm sure the best is yet to come as the temperatures rise and summer welcomes us with open arms. 1. Roolee Top - I'm not one to play favorites (lie) but this might just be it. I almost hate clicking over to their site because I inevitably fall in love with almost everything. Every time. 2. 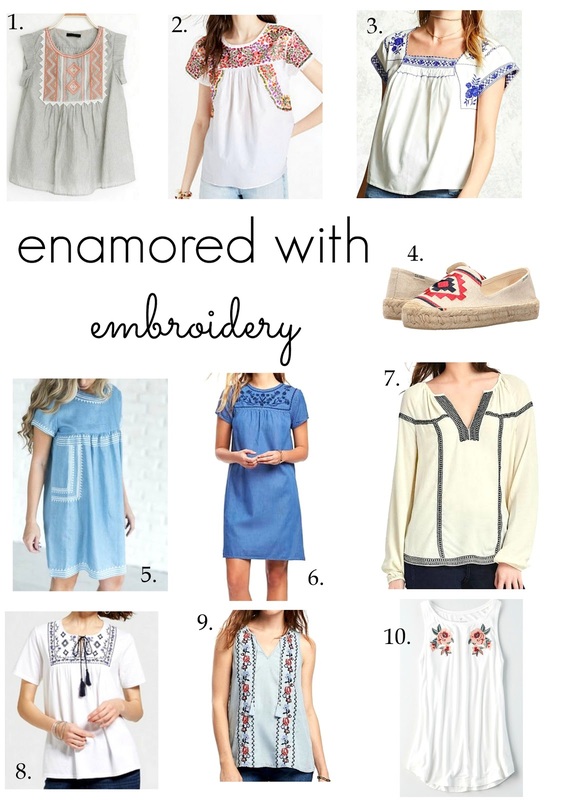 Madewell Blouse - I'm going to hold out hope that this doesn't sell out, and then goes on clearance and then goes on super clearance so that it magically becomes a feasible and responsible purchase. 3. Forever 21 blouse (also comes in red) - I like that this is a little looser and I tell myself it would be a smart investment to wear over a nursing tank this summer. Maybe? I'll let you know. 4. smoking slipper - for all the smoking on my upcoming docket. I'm eying these like a hawk in the hopes that they go on random sale because I've had great luck with that brand of footwear before. The year is young - I have faith. 5. tunic - I have the shirt version of this tunic and love it. This would make a great pool/beach coverup but I would also totally wear it to church. With my smoking slippers. 6. Old Navy shift - I knew they'd pull through. This will inevitably go on super sale - multiple times. I just hope it doesn't sell out before then. 7. long sleeve blouse - I don't know why but I love flowier long sleeve blouses with shorts in the summer. I know, I know - it's too hot for long sleeves but if I have a day of errands planned I always wear long sleeves because I know the a/c will be bumping at an uncomfortable level of cold in allllll of the stores. Preparedness and cold-blooded are not my middle names but perhaps they should be. 8. tassel top - this might be my second favorite find. It just might. 9. tassel tank - no profundity here - I just think its cute. 10. AE tank - also comes in grey which I might prefer over the white? I don't know. let me know if you've seen any others out in the retail wild - I'm sure this is just the tip of the iceberg. Happy (last 13 minutes of) Tuesday! if you scroll down on my sidebar I have a "better blogs" section :) but I probably should update it - thanks for the reminder!!! Killing it with the sale/clearance strategies. Same. And lol - "preparedness and cold-blooded are not my middle names but perhaps they should be." I haven't received it yet but I'm hoping it isn't too short!